Torque Tube design eliminates O-rings and packing in Model 75 level controls. Float assembly removes easily from chamber for periodic inspection. Four 1" NPT process connections provide for top/bottom "flow through" or side/side mounting. Enclosures are available in general purpose, NEMA 1. Cast iron chambers are available for pressure to 300 psig (21 bar) at 425°F (218°C). Cast steel and 304 stainless steel chambers are rated for 400 psig (28 bar) at 500°F (260°C). All types will operate to a minimum specific gravity of 0.66. Service: Compatible liquids. Cast iron is not for use with lethal or flammable substances either liquid or gaseous. Wetted Materials: Body: cast iron, cast steel, or 304 SS; Float: 304 SS; Torque Tube: brass or 304 SS; Body Gasket: carbon. 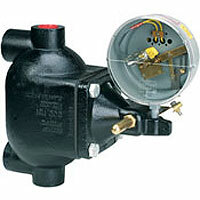 Temperature Limit: Cast iron body: 425°F (218°C); cast steel or 304 SS body: 500°F (260°C). Pressure Limit: Cast iron body: 300 psig (20.7 bar); cast steel or 304 SS body: 400 psig (27.6 bar). Switch Type: SPDT mercury switch. Optional SPST or two stage. Electrical Rating: 10A @ 120 VAC/DC, 5A @ 240 VAC/DC. Conduit Connection: 7/8" (22.23 mm) hole for 1/2" (12.7 mm) conduit. Process Connections: 1" female NPT. Four for side/side or top/bottom mounting. Weight: 35 lb (15.9 kg). Agency Approvals: UL and CSA. Deadband: Approximately 1" (25.4 mm). EXAMPLE 75KM A 4820 75KM-A-4820 Liquid Level Control with cast iron float chamber*, stainless steel float and brass trim, SPST mercury switch,open on level increase, rated 10 amp 120VAC/DC, 5 amp 240 VAC/DC, motor rating 1 hp 120 VAC, 3/4 hp 240 VAC, 1/3 hp 120/240 VDC, general purpose enclosure, minimum specific gravity 0.66, maximum pressure 300 psig (21 bar), maximum temperature 425°F (218°C). HOUSING 75KM General purpose, NEMA 1 enclosure, construction A, C only. 75KXM General purpose, NEMA 1 enclosure, construction A1, A2, C1, C2 only. CONSTRUCTION A Cast iron chamber*, stainless steel float, brass trim, minimum specific gravity 0.66, maximum pressure 300 psig 21 (bar), maximum temperature 425°F (218°C). A1 Cast steel chamber, stainless steel float, brass trim, minimum specific gravity 0.66, maximum pressure 400 psig 28 (bar), maximum temperature 500°F (260°C). A2 Cast 304SS chamber, stainless steel float, brass trim, minimum specific gravity 0.66, maximum pressure 400 psig 28 (bar), maximum temperature 500°F (260°C). C Cast iron chamber*, stainless steel float, 304SS trim, minimum specific gravity 0.66, maximum pressure 300 psig 21 (bar), maximum temperature 425°F (218°C). C1 Cast steel chamber, stainless steel float,304SS trim, minimum specific gravity 0.66, maximum pressure 400 psig 28 (bar), maximum temperature 500°F (260°C). C2 Cast 304SS chamber, stainless steel float, 304SS trim, minimum specific gravity 0.66, maximum pressure 400 psig 28 (bar), maximum temperature 500°F (260°C). CIRCUIT 4820 SPST mercury switch, open on level increase, rated 10 amp 120 VAC/DC, 5 amp 240 VAC/DC, motor rating 1 hp 120 VAC, 3/4 hp 240 VAC, 1/3 hp 120/240 VDC. 4821 SPST mercury switch, close on level increase, rated 10 amp 120 VAC/DC, 5 amp 240 VAC/DC, motor rating 1 hp 120 VAC, 3/4 hp 240 VAC, 1/3 hp 120/240 VDC. 4815 SPDT, consists of two SPST mercury switches, electrically independent, one circuit closes as one circuit opens, each switch rated 10 amp 120VAC/DC, 5 amp 240 VAC/DC. 4823 SPDT, consists of two SPST mercury switches, electrically independent, one circuit closes at low and intermediate level, open at high level, one switch closes at high and intermediate level, open at low level, each switch rated 10 amp 120VAC/DC, 5 amp 240 VAC/DC. 4831 SPDT, consists of two SPST mercury switches, electrically independent, one circuit closes at low level, open at intermediate and high level, one switch closes at low and intermediate level, open at high level, each switch rated 10 amp 120VAC/DC, 5 amp 240 VAC/DC. 4849 SPDT, consists of two SPST mercury switches, electrically independent, one switch closes at low level, open at intermediate and high level, one switch closes at high level, open at intermediate and low level, each switch rated 10 amp 120VAC/DC, 5 amp 240 VAC/DC. 4853 Consists of one SPDT and one SPST mercury switch, SPDT switch has one circuit closed at low and intermediate level, open at high level, one circuit closed at high level, open at intermediate and low level, rated 4 amp 120 VAC/DC, 2 amp 240 VAC/DC, SPST switch closed at high and intermediate level, open at low level, rated 10 amp 120 VAC/DC, 5 amp 240 VAC/DC. 4855 Consists of one SPDT and one SPST mercury switch, SPDT switch has one circuit closed at low level, open at intermediate and high level, one circuit closed at high and intermediate level, open at low level, rated 4 amp 120 VAC/DC, 2 amp 240 VAC/DC, SPST switch closed at low and intermediate level, open at high level, rated 10 amp 120 VAC/DC, 5 amp 240 VAC/DC. 4874 Consists of three SPST mercury switches, one switch closed at low and intermediate level, open at high level, two switches closed at high and intermediate level, open at low level, all switches rated 10 amp 120 VAC/DC, 5 amp 240 VAC/DC.